The goal of the NATEF-accredited Automotive Technology Program is to prepare students for employment in the automotive services industry. Graduates are employed in sales, parts,and technician positions. This program combines the study of college-level general education courses and extensive course work in automotive theory and lab classes designed to prepare graduates for entry level careers as technicians, service advisors, parts specialists, and managers. Earn a certificate and get to work within a year. Continue your passion in our Associate degree coursework and tackle more complex diagnostics and repairs. Ready for management? Earn a Bachelor's degree from Missouri Baptist University at Jefferson College! 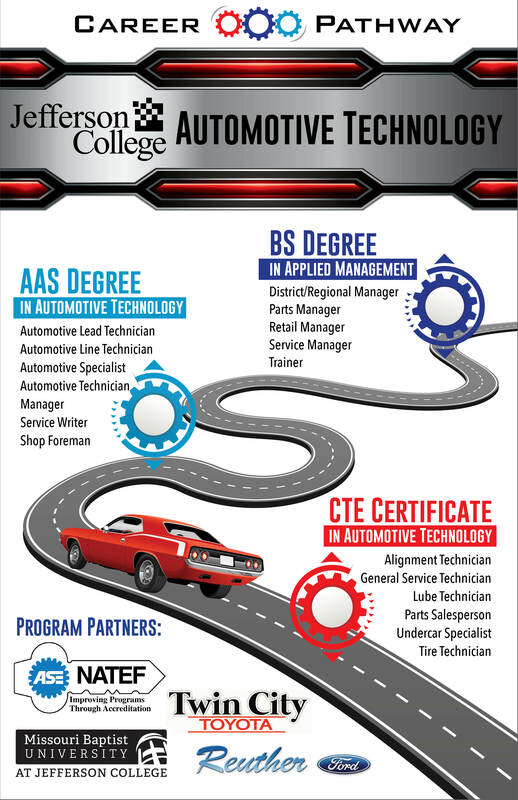 Check out the complete pathway and hit the road toward an exciting career in automotive technology! Jefferson College Automotive Technology department recently welcomed Garage Gurus national trainer Rick Kearns for two training sessions in October. The high school and college classes were taught Brake Systems and Traction Control with Vehicle Stability Control. Garage Gurus is very popular on YouTube as a reliable source of vehicle information. Guru Rick Kearns travels extensively to educate technicians on proper repair techniques. Thanks for the visit! Sadie Hefflinger from Northwest High School was selected as a 2018 winner in a non-traditional career field. Sadie received a scholarship from the award to be used towards continued education in her field from the Department of Elementary and Secondary Education (DESE). We would like to congratulate Sadie for being chosen from a field of 86 candidates. Great job Sadie! Students from the Jefferson College Automotive Technology program recently competed in the East Central District SkillsUSA competition. Chris Trusty received a Gold medal and William Antommaria received a Silver medal in their Automotive Service Technology competition. Chris Trusty will go to state level competition in April at State Technical College to represent Jefferson College. We wish him well! Jefferson College students from the Automotive Technology program recently participated in the Oil Changes for Veterans event at Meineke Car Care Center. The college and high school students performed over 80 oil changes for free as a service learning project. Jefferson College students worked all day servicing veterans cars in five out of six bays getting real world automotive shop experience alongside automotive students from Ranken Technical College. Automotive instructors Gerard Uhls and John Scanga were working with the students to keep the work flow moving and to double check the work performed.